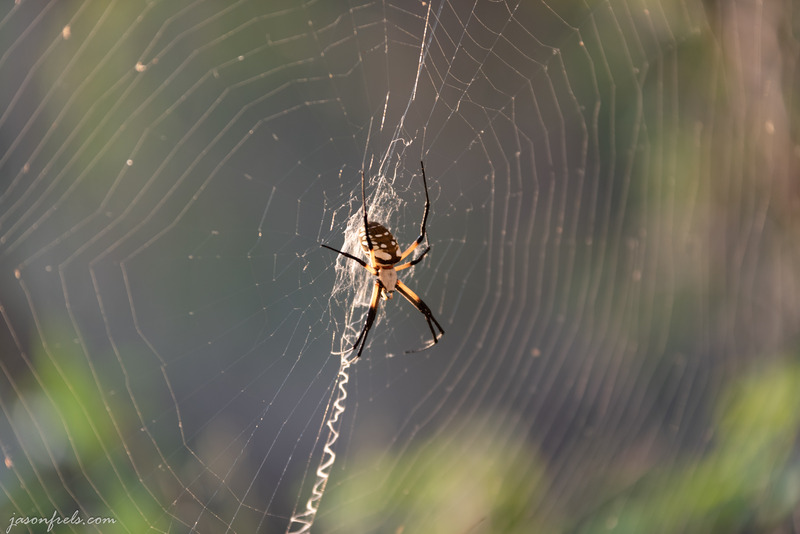 I was walking through the tall grass and bushes around Inks Lake trying to find a good photo and carefully watching the ground for cottonmouth or copperhead snakes when I looked up and saw a big spider. I have seen these things around since I was a kid and they’re kind of big and creepy looking and I am glad that I didn’t run into her web. Looking online, I found that these are called Black and Yellow Garden spiders and found that they’re common across North America, and they are not venomous at all. I decided to get the 70-200mm lens and see if I could get any close up photos of the spider. First I had to go around the other side of the web to get a top down look at her. 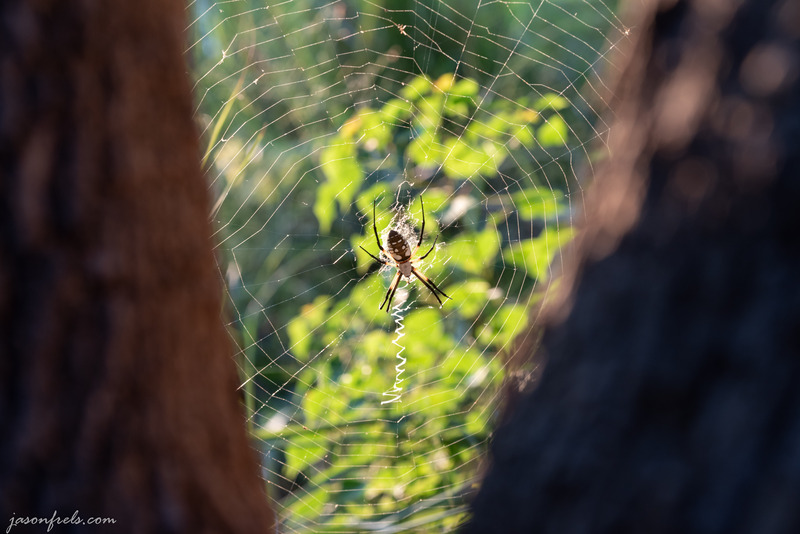 I tried shooting through the crotch of a tree as I thought that it might frame the spider a bit. And at this point the spider was backlit by the setting sun. I was shooting at f/8 to try to get a little texture on the tree bark in the foreground. That left the shutter speed at 1/50s which is pretty low for hand-holding 140mm, but I had the vibration reduction enabled and it turned out pretty sharp. Next, I crept around to the side a bit to try to get a bit of her profile in the last rays of the sun before it set behind the hill. I did see her bounce her web a few times and I read that sometimes they do this when larger animals are near so that they will see it and not run into the web, I guess. Here I opened up the aperture to the widest setting to get as fast a shutter speed as I could. This also had the effect of blurring out the background well so that the spider and web stand out nicely (compare to the first photo taken at f/8). I was also trying to avoid getting the spider inside the minimum focus distance of the lens which is listed as 140cm. The light was fading fast and I needed to get moving and find a place to set up for a landscape shot and I was a bit concerned about snakes, so I moved on and left the spider to catch some insects. Hope you enjoyed the spider. Leave a comment if you like. 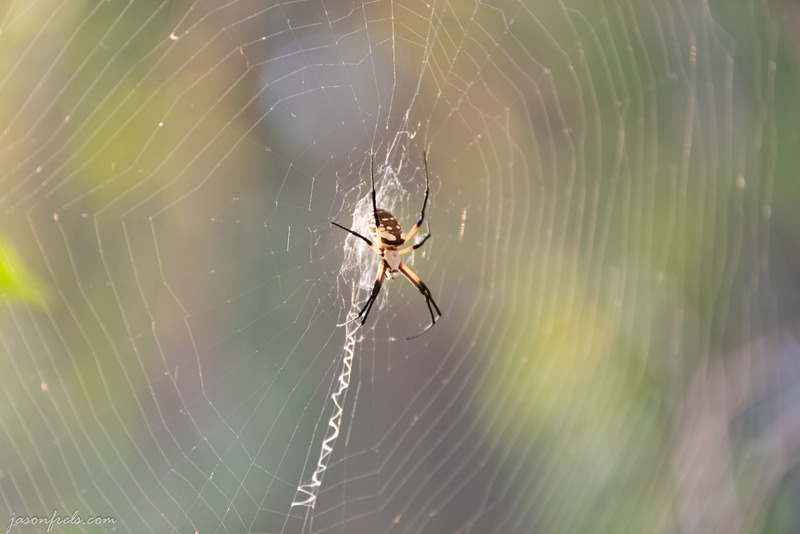 I think your spider photos are great, but I’m very phobic about spiders, so this post was a little hard to read. I was more concerned about snakes at the time as I was out in the weeds. And ticks? Or is the tick season over? I didn’t think about ticks. They may not be a problem this far west in Texas. When I lived in east Texas and up around Tulsa OK, there were tick problems. I have not seen one on my dogs since I have lived around Austin. Fleas and chiggers are a problem though. Last spring when I took the cactus flower pictures I got a lot of chigger bites and they took week or so to heal. You go through a lot to get those perfect shots! A person has to have a hobby that takes their money and keeps them at risk of injury and discomfort. I like the one framed by the crotch of the tree. I think that it gives a bit of scale to the photo. I just hated writing ‘the crotch of the tree”, but I couldn’t think of what else to call it. The problem was also that it made me want a macro lens, which I don’t have. So this may end up costing me money. 🙂 As a woodturner I would say that it’s exactly the correct term and I knew precisely what you meant.